Apple fell to sixth place in global notebook shipments last quarter, according to a TrendForce report. Worldwide shipments grew 10.2% quarter over quarter in 2Q18 and 2.8% year over year to 41.08 million units. It’s estimated that shipments will advance 5-6% QoQ in 3Q18. Last year, HP topped the rankings with 26.2% market share. Following behind was Lenovo at 20% and Dell at 19.6%. Acer surged up to take fourth at 8% as ASUS and Apple fell to fifth and sixth, respectively. It’s believed that Apple could make a comeback in Q3 with the launch of its new MacBook Pro and the upcoming launch of a new MacBook Air. There was a significant reshuffling of the ranking from the fourth to sixth place. Acer climbed from sixth to fourth with its market share rising to 8%. Acer’s gain was attributed to the additional shipments that were originally set for the first quarter but then delayed and later delivered in the second quarter. ASUS fell to fifth in 2Q18 with its market share at 7.4%. ASUS’s performance in the notebook market in 2Q18 was negatively affected by the leftover inventory from the previous quarter. Apple also retreated to sixth with its market share sliding to 6.5%. The second quarter was the transition period when Apple was preparing for the releases of the upcoming new MacBook devices for the year. 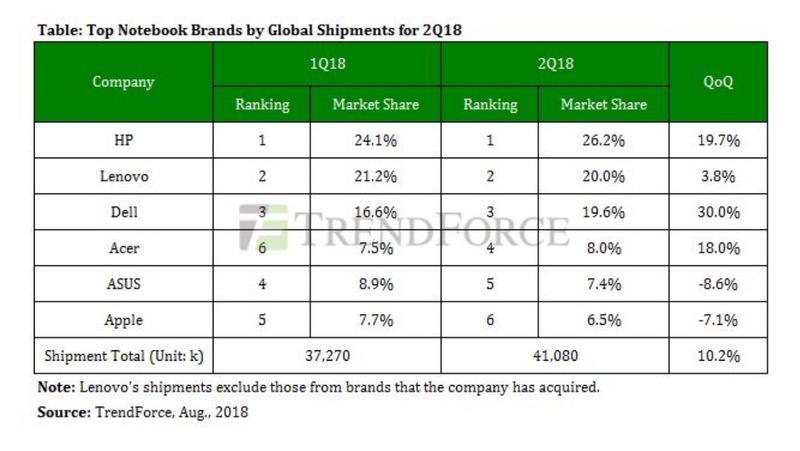 TrendForce therefore expects MacBook shipments to again post a large QoQ increase in 3Q18, as Apple will be releasing a new MacBook Pro at the start of the quarter and a new MacBook Air at the end of the quarter. Next → Next post: ۱۰ تا از بهترین آنتی ویروس پرتابل بدون نیاز به نصب برای کامپیوتر ، فلش و..